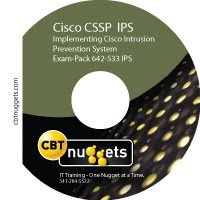 Exam-Pack: 642-533 IPS will show you how to deploy, configure and maintain IPS sensors on your corporate network. This includes using both the GUI and command line administration environments for setting up and maintaining your IPS. You’ll even learn how to configure it to manage access lists on all your network devices. This allows you to setup on-the-fly access list configuration on other Cisco devices to block the intruder’s IP address from reaching the network. I want to give IPS exam. I have downloaded CCSP IPS 642-533 Pass4sure v4.18 – 118Q – PDF and I am not able to open the same as format is rsapi.cgi. Can anyone tell me how to open .cgi files.Please help. Has anyone the valid dumps or a pdf file with the questions? These dumps are still valid. Just make sure you check all options while reading dumps bcoz some question are vise a versa. Can anyone please confirm it is still valid ? Has anyone passed in last few days ? hi, Please can any one confirm me whether IPS 642-533 dumps are still valid ? Which one are still valid? The 1.8 from actual Test or the Pass4sure v4.18? it means that ur passed after 3 february. When did u passed ? Labs are same ? Hii, Can anyone confirm me is this dumps are still valid ? Did anyone pass the last few days? Is the dump still valid? Guys p4s exam is asking for password.. Any idea? Hello, I wonder if the labs are the same as the published P4S or vary a lot from this. Just saw a new version of P4S with 150 questions if anyone can upload is appreciated. Happy new year for all !!!! alhamdulillah, this dump is valid. i passed yesterday.while practicing the dumps you should be aware of all the choices, they may ask about the wrong answers instead of the right answer!!!! 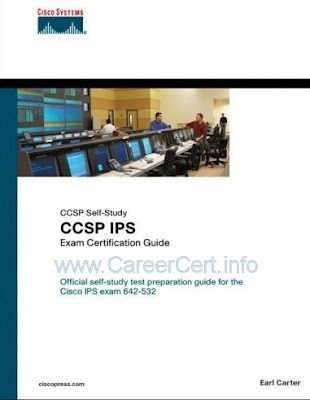 thanks alot career-cert, i completed my ccsp. you have done a great job!!! i HAVE a 5520 ASA and AIP-SSM-10 IPS module… or if you want to send it privately to me .. let me know…. 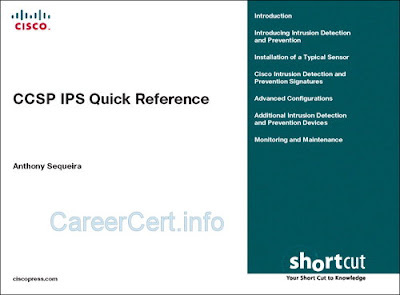 Passed IPS yesterday (13/12/2010) with 1000 score. Thanks to Allah. P4S (118Q) and AT(113Q) still valid. 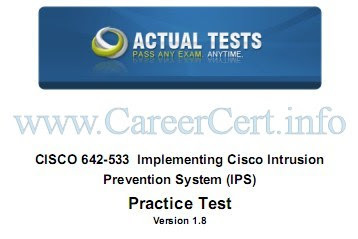 Please, could you publish study materials for the new 642-627 IPS v7.0 certifcation? Thank you for your help and keep going! This Testinside is still valid? Requesting mirror upload for CBTNuggets IPS. Preferably 4shared. Yes it is still valid, passed on 11/30/2010 with a good score. Had 5 drag n drops, 1 Simlet and 2 labs. I used the P4S and the Actual test. CBT files are removed from 4shared and rapidshare. could you please upload again? CBT Links have been updated. Thank you very much for updating the links. It seems part 5 of the CBT Nuggets is missing. When I tried to unzip the files, its asking for part 5, and also 21videos have been extracted with the 4 parts where as total number is 25. Could you please update the part5 ? Configure the DMZ sensor to “deny all connections” when an events risk rating is 80 or above and exempt your management station from this policy. Do I need choose DENY CONNECTION INLINE or DENY PACKET INLINE?, when I’m setting. 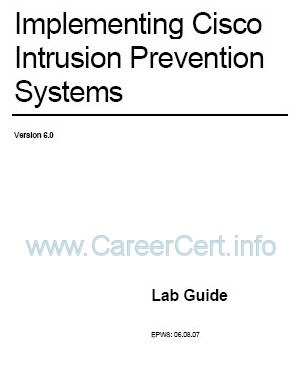 please tell me …….IPS(642-533) p4s version 4.18 in PDF Format available here, still valid or not…. Yes it is still valid, passed on 11/18/2010 with a perfect score. Had 5 drag n drops, 1 Simlet and 2 labs. I used the P4S and the Actual test. 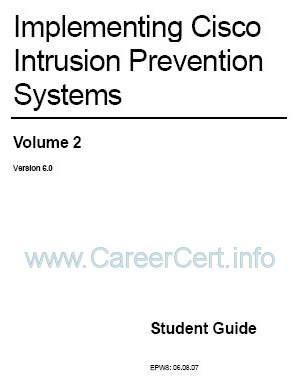 Hi Rajesh…..the p4s version 4.18 is still valid.I passed my exam today with very good score. Is the v4.18 still valid? i dont think it is the latest one, can sum1 confirm pls? This site is toooooooooooo goood. One site for all certification material.. Thanks guys…. Passed yesterday 19.07.2010. There were no unexpected questions. All were from P4S. 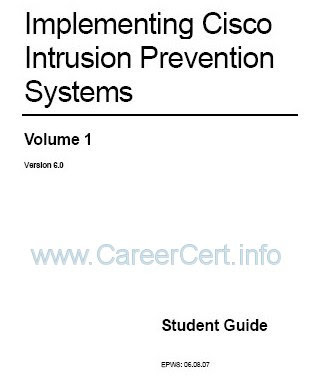 Can any one tell me …….IPS(642-533) p4s version 4.18 in PDF Format available here, still valid or not…. That link is working ! You should try again. 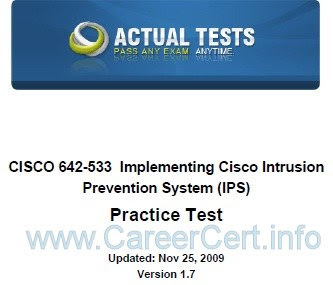 I have pass my exam 642-533, thank you great info here!!!! there´s a new version of P4S for this exam??? Is there any simulator available for the Cisco IPS? Dear I haven't set any password on ips cbts !! Could you plz provide me the PASSWORD for this IPS video. There is no password dear.